Where can I collect my free glass & festival book? Alba is the Scottish gaelic word for Scotland. An ALBA is during the festival equal to 1 EURO. They can be purchased at our sales desk on stand no.5. They are available individually or in sheets of 10. Can I pin cash at the festival? Unfortunately not, there is NO PIN facilities at the festival. There are 3 banks with pin machines within 100m of the church. Are all the whiskies free? The answer here is NO All stands have a selection of whiskies which can be tasted free of charge included in your entry price. 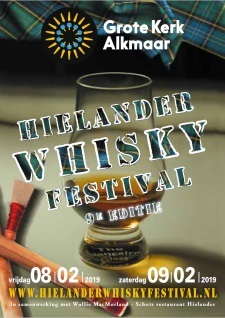 For the more specialised Whiskies the amount asked per glass is at the discretion of the individual exhibitors. Can I buy bottles at the festival? Simply answered? NO. Dutch law does not allow the sale of closed bottles by exhibitors. Where can I register for my masterclass? Where can I register for my guided tour? Where can I register for the “QUAICH CHALLENGE 2018” charity blind tasting? CERTAINLY! Hielander Scottish Restaurant has three stands spread over the church where you can choose from; smoked salmon, Pate, Islay beef stew, cheddar-cheese. Spicy meatballs and of course our famous Haggis. Maximum price is 5 alba’s per portion.